This pizza was inspired by a hamburger. Ok, I know that sounds really strange but we were watching the Diners, Drive-ins & Dive one night & saw this burger topped with a bourbon poached peach. We both thought the peach sounded great & would be perfect on a pizza with a good stinky brie. This seems like it would be a dessert pizza but it was really quite savory. The sweetness of the peach is tempered by the bourbon & the brie. Onion adds a nice bit of sharpness. I would have also put some arugula on this if we had had any in the house. Save any peach slices you don't use & the bourbon to pour over ice cream. Put bourbon & sugar in a small saucepan & bring to a simmer over medium heat. Stir to dissolve sugar. Add the peaches & simmer for about 10 - 15 minutes until soft, stirring from time to time. Spread pizza dough out on a greased baking sheet. 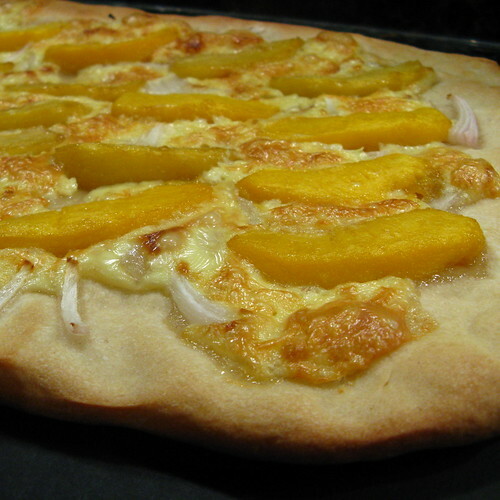 Top with onions, brie & peaches. Bake for 15 minutes until top & crust are golden brown. I *love* this! It's full of things I love. Especially brie! What a match made in heaven! You come up with the best flavor combos, seriously. Awesome! 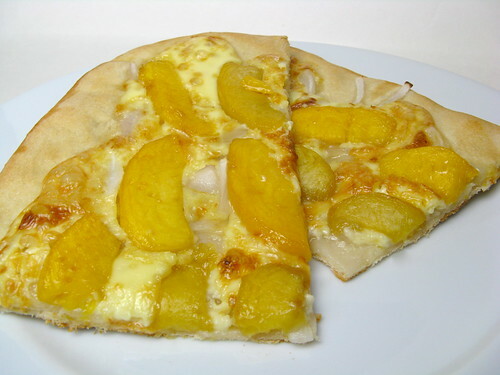 I would never have thought to make a savory pizza with peaches and your declaration that this was inspired by a hamburger threw me for a loop. But it's not hard to imagine how good this would taste by your description; mentioning arugula sealed the deal! Utah peaches are so good right now. I have got to try this! Great pizza choice! I love that show! I get so much inspiration from that show. We've started to like Guy Fieri (Mike still loses it when Bobby Flay and his Mango Chutney is even mentioned....) and this pizza sounds delicious!!! Sounds like it could be a great appetizer or even a desert? minus the onion? Your photos are always so beautiful!!! i think you need to start a delivery service to nyc so i can try! i'll say it--i enjoy guy fieri. d3 is one of my favorite food network shows. great catch, spotting this idea--you took it and ran with it and made an awesome dish! WHat a fabulous idea! I love this one. OMG... What a great use of two of my favorite ingredients. Now this is a must try recipe! Okay, so obviously I haven't been around in a while and I missed one heck of a week! :) Bourbon-poached peaches! I'm all over anything with bourbon. In a week, I'll be back to an endless supply. Ha, ha! I love Diners, Drive-Ins and Dives, but I missed this episode. Such a great flavor combo!